Hello all and thank you for joining us as we celebrate the new product release from Simon Says Stamp called Reason to Smile. Yay! This release has stamps, dies, embossing powders, and even includes felt! 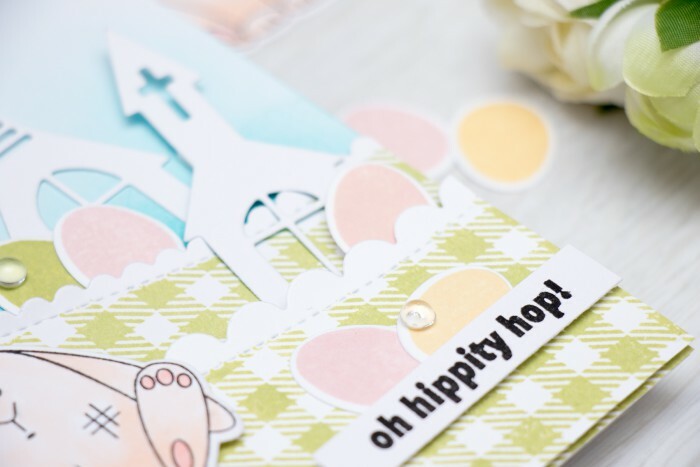 I’m sharing a fun Easter card today and squeezing in a bit of creative die cut masking. I started working on this card by creating hills for my bunny to sit on. I used my favorite Wavy Scalloped Stitches dies and cut two out of white cardstock. Next I made a mask and masked off the scalloped part (I wanted to keep it white) and stamped the Gingham pattern using Willow ink onto the rest of the die cut. This way I was able to create colorful hills with white scalloped borders. I am explaining how to make a mask for the hills on my video, however I admit, I probably over did it, lol! There definitely is an easier was to make a mask. I also blended a bit of blue High Dive ink onto the card base to create the sky. That helped the scallops from the top hill to stand out a bit better. The bunny was stamped using new Intense Black ink and colored using a few colors of Copic Markers (I used E000, E00 and R20). Easter eggs were stamped in Duckling, Twirling Tutu and Catkin and were die cut using a matching die. I also die cut two church buildings for this card as I felt I needed to add something to fill in the background. The sentiment, Oh Hippity Hop was stamped in Versa Fine Onyx Black and was foam mounted onto the card. I also added several clear droplets from Pretty Pink Posh as little accents onto my card. I filmed a video tutorial showing how to make this project, you can watch it at the top of this post or below or on my Youtube channel. If you like it, I would appreciate you giving it a thumbs up and sharing. You can also pin it t Pinterest to watch later. Thank you! The next stop on the hop is amazingly talented Kristina Werner. You can also start at the beginning at Simon Says Stamp Blog. Want to win a Simon Goody bag? Please leave a comment on this post telling me your favorite product from the new release. Please leave a comment by the end of the day, Sunday, February 21st. Winner will be announced in this blog post and also on Simon Says Stamp blog on Tuesday. Thank you everyone for your lovely comments, the winner of the giveaway is: Rita Fujisawa. Congratulations! Simon’s team will be in touch with you. Be sure to check out this card I created using stunning daffodil stamps and dies. I love these particular flowers, they are very dear to me. Lovely cards and I actually loved hearing the exotic animal sounds! Quite calming! 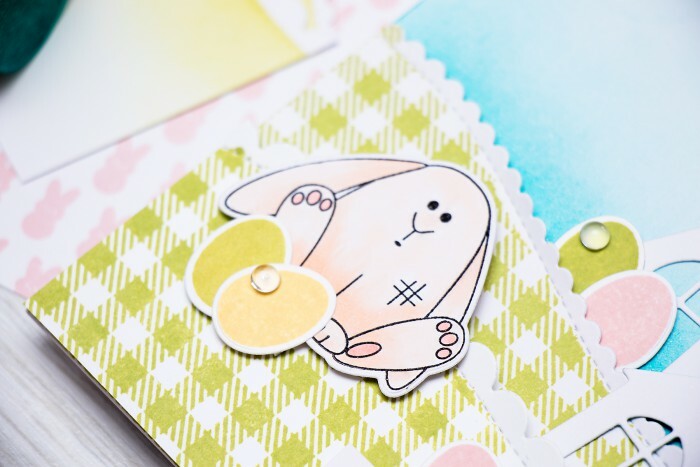 Cute, cute cards – love the soft colors !! Thanks for sharing !! Love the bunny card! It is adorable! Love it! 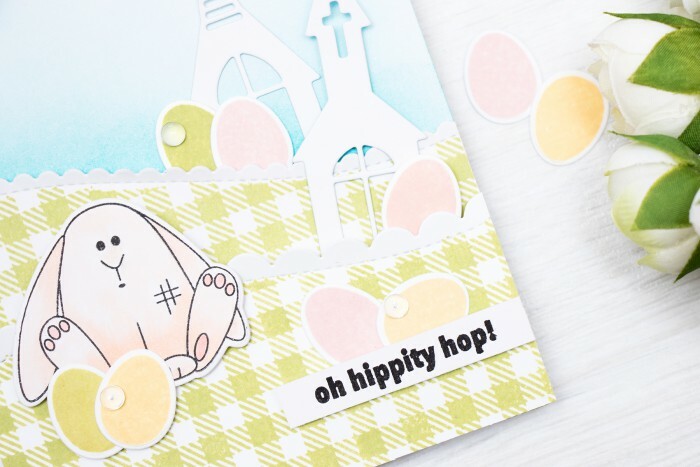 Can’t get over that gingham background stamp, I think it’d be perfect for tons and tons of cards all year round! Wow…absolutely fantastic. Love how you used the products! My fav from the release is the gingham background. That bunny is the cutest thing ever! Love that you used pattern paper. Love that bunny with the church in the background. Love both of your cards. Thanks for the video. beautiful cards with all this details! 😀 excellent! 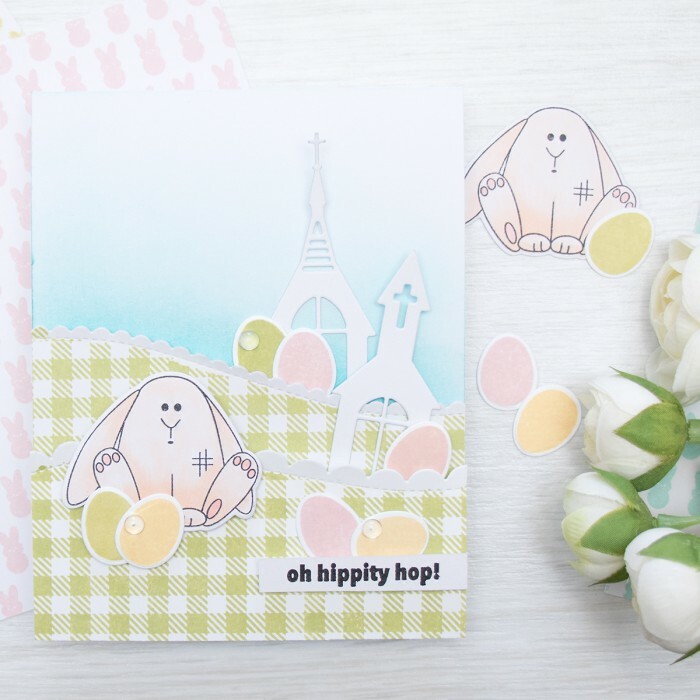 I like the die cut churches on your bunny card, so many Easter cards leave out Christianity altogether! I really love the gingham background stamp. I think this would be a very useful stamp to add to my collection! What an adorable Easter card!!! Cute little bunny card. But my heart belongs to flowers. Love your bunny card. The flowers are gorgeous. 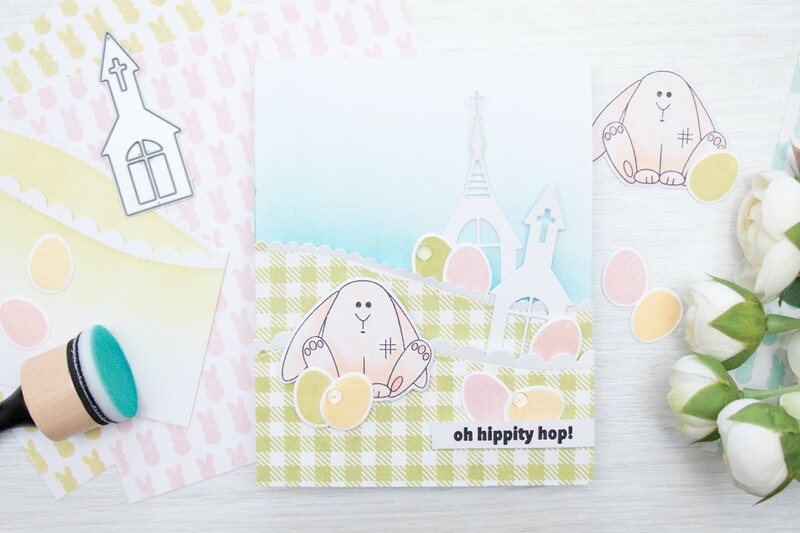 Great cards- love that adorable bunny! 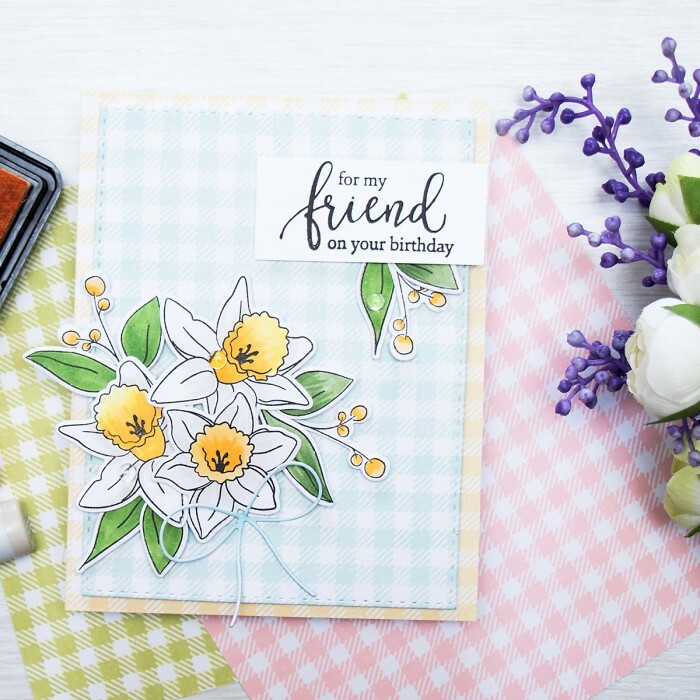 Such a cute bunny card and your daffodils look almost real – beautiful! Love your video!!! Loved the copic shading on the bunny!! I really liked the bunny card and thought about buying the set. I need to now. Thanks for the inspiration. So pretty, gets me excited for Easter and spring! Such a very cute card! PErfect for spring.